Muddle 5-6 mint leaves, 3 drops bitters, and 3 lime quarters in the bottom of a tall mojito glass. Add 2 ounces light rum. Fill the remainder of mojito glass with guarapo, leaving ½" at top of glass. Top off with club soda. Cover the glass and shake vigorously for 4-5 seconds. Serve with straw. Garnish with lime wedge and sugarcane stick. 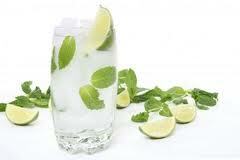 The mojito is done.....enjoy and refresh !